The backdrop for this novel is the 2015 Syrian crisis and the November 13th Paris nightclub attack that lead to a manhunt in Brussels, followed by the bombing of the Brussels airport. Thirteen-year old Max and his family have moved from America so his father can be a defense consultant to NATO. They now live in an upscale neighborhood in Brussels and while sister Claire attends The American School, Max is enrolled in a Belgian school where classes are taught in a language he barely understands. He is bullied and feels stupid in class. Fourteen-year old Syrian refugee Ahmed has lost his entire family in the Syrian War and during their escape to Europe. He finds himself stranded in Brussels after having lost his last family member, his father, and his money and cell phone to an unscrupulous smuggler. He takes refuge behind an unlocked door to the unused wine cellar in Max’s townhouse. The boys meet and bond and so begins the dangerous story of hiding Ahmed from the authorities and finding a place for him to thrive. They make some friends and together learn about a historical parallel that took place in the same residential block seventy-three years earlier. During WW II someone hid an orphan Jewish refugee from the holocaust. He was turned in by neighbors who were Nazi collaborators. The boys are determined that this will not happen to Ahmed but as the police search for terrorists the danger escalates. Tessa's Picks, 5-8th grade, Character Driven, Fast paced, Global perspectives, Historical Fiction. Hallelujah,Miss Eula is back! One of my favorite characters in Polacco's many wonderful books, this African-American grandmother takes the young Patricia under her wing when the author moves to California as a young girl. Before Trisha's own grandmother passes away through the "holes in the sky," she tells her granddaughter that she will send a sign that she is watching from the other side. The family moves to a diverse neighborhood in Oakland where Trisha is befriended by Miss Eula's grandson Stewart. They join forces with the entire neighborhood to save a hurting neighbor and her dying garden. And Trisha finds her sign. A heartwarming celebration of community, diversity and family. Featuring a diverse cast of characters, this book sends the message that life is not color coded. 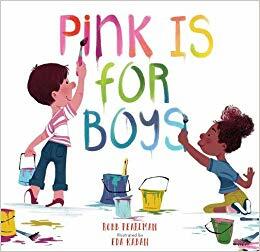 Just as boys and girls can enjoy race cars, unicorns, dress-up and baseball, they can like all colors as well. Every color is for every one! So express yourself in a rainbow of colors! Felix loves to wear skirts; they feel fun and airy. He and his mom go to the store and buy him a new red one for the first day of school. Dad is a little worried about this decision and indeed Felix is teased when he arrives in a skirt. After discussing how unfair it is that girls can wear both pants and skirts but boys can only wear pants, he and his dad make a trip to the store. Both dad and son go to school dressed in twirly skirts and respond to the other boys' questions with "Today anybody can wear a skirt. Did nobody tell you?" 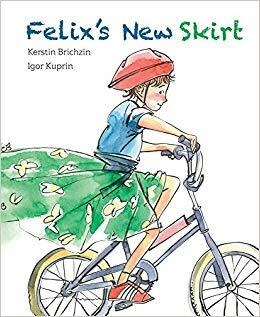 From then on no one asked Felix if he was a boy or a girl; they simply called him Felix. The mom and dad in this empathetic book are so sweet and supportive. And the dad really rocks that green skirt. ​Tessa's Picks, K-2nd grade, Family life, Issues Fiction Picture books..
(Don’t) Call Me Crazy is a compilation of written and sketched material that gives the reader a look inside the mind of someone who is different from them or perhaps quite similar. It made me laugh, cry and relate. The symptoms of their mental diagnoses change the way these individuals operate and present many challenges. Their struggles are related to their behavior. They are not what has plagued them. They make it very clear that being open about mental illness is a crucial step in removing the false concept of what it is. These writers and artists express their disabilities so that others can too. Their voices come from a place inside of them that is vulnerable and honest. This book should start a movement. People who have mental disabilities are getting helped by professionals, medication does work but not for everyone, and you should never be ashamed because working on yourself is brave. People who are not familiar with mental illness will also benefit from this book. They will understand that people struggle with symptoms that set them aside from others and fight to be understood everyday. Being sick does not make you a diagnosis. I am truly inspired by Kelly Jensen’s motivation to bring this very important book to life. Read this book to learn about what many people go through. You will feel them there with you, comforting you with assurance and telling you the truth. ​Tessa"s Picks, 8th grade, Mental illness. These are comments Isabella is used to hearing. Her father is back and her mother is white and now that they divorced, it seems like she is split in two. Not only does she have to switch houses, nicknames, and backpacks; it seems like she has to switch identities too. Both parents have moved on to wonderful new partners in their lives but even a supportive “new” older brother can’t make her feel whole. Changing houses each week brings her parents together in an awkward and sometimes unpleasant meeting. But both are supportive of Isabella’s musical talent as a gifted pianist. The high point of her career is the upcoming recital. The shocking climax of the book comes on the way to the recital when an ugly and dangerous racially based incident occurs. The whole extended family comes together in solidarity and love to support her. This is a window and mirrors book that will evoke empathy in many a young person. ​Tessa's Picks, 4-6th grade, Character driven, Family life, Issues fiction, People of Color. Yes, those are their names and of you have not lost your appetite yet you may find this a sweet treat. The Cakes are itinerant bakers…which means they move from town to town setting up bakeries for communities that “need them.” Emma has said goodbye too many times and has a friendship map to track the ones left behind. Her heart can’t take the ache again so she is determined to remain solitary in their new home in Aurora County, Mississippi. Then she meets Ruby Lavender who is “not sweet” but becomes her new BFF (well maybe not forever). Delightful characters abound in this small town and all the children and dogs make them selves right at home. The father Leo, whose memory is a little sketchy, has a funny feeling about the town and it only a matter of time before he will want to wander on. Can Emma and Ruby find a way to make this place Emma’s forever home. Silly and sweet, these folks will capture your heart. “Each day we begin again our quest to be safe, to be loved, to belong, and to find home. ​This early tale of biomimicry is based on historical fact. 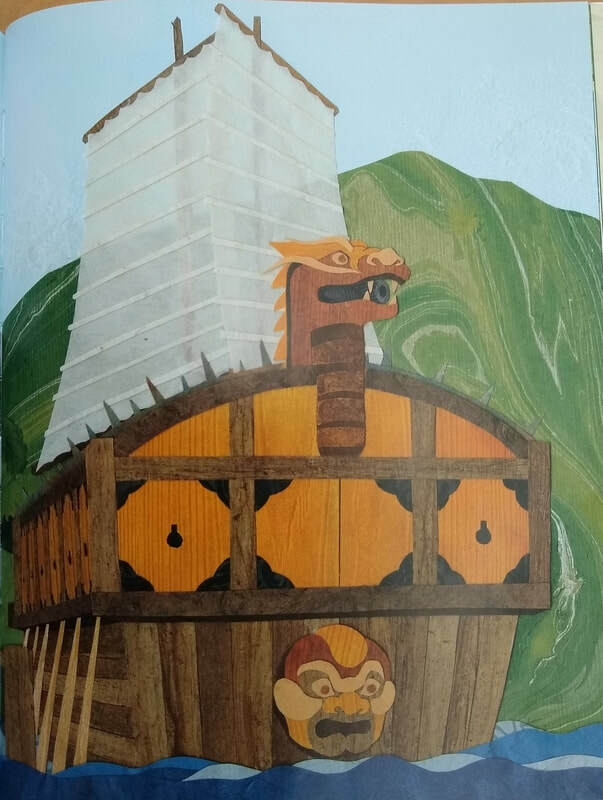 The Gobukson (or turtle ships) were known for their powerful design that included ironclad covering long before any western ships did. The story follows a young boy who observes a turtle in nature and then takes him to the emperor to illustrate his idea. This is a great book for budding inventors and could easily be paired with a maker's activity on boat building. The illustrations are intricate collages that lend the book a sense of warmth and solidity; you can almost feel the textures beneath your fingers. This really helps showcase the various design elements of the ship. ​This wise book starts off reassuring readers that when you go out into the world, you may have questions about what you see, and that is okay. People live in many different ways. It goes on to give an example of a kid walking to school and seeing a man sleeping on the street. The child asks "Why would he sleep outside?" The book answers with matter of fact, developmentally-appropriate language and continues to other questions from what is poverty to what is a fundamental human right to how can I help. This book is an excellent resource for parents or educators looking for language and advice on how to broach this topic with children. You could even just sit down with a child and read the whole book together. I love that the book comes from a place of curiosity and compassion. It doesn't talk down to the reader or make them feel bad for asking perfectly natural questions. Illustrated with a mixture of watercolor and photographs, this approachable book is a must-read. Then you've come to the right place! Follow the blog to see the latest recommendations from Tessa and Erica. Browse by subject to see past recommendations in each category.